We offer a spectacular array of countertop surfaces, unparalleled craftsmanship and VIP service to one client at a time, all at prices you’ll find delightfully hard to believe. Your custom requests are limited only by your imagination. Your satisfaction is guaranteed. We love to spoil our clients! We believe that the experience of decorating your home should be pleasurable and free from unnecessary stress. You’ll be genuinely pampered by every one of our team you’ll come in contact with. With direct VIP access to owner Carlos Chavarria’s cell phone, you’ll never wonder who’ll be taking your call when you have questions or need advice...it will always be Carlos. Stone countertops are guaranteed to add rich beauty and increase the value of your home. To ensure your one-of-a-kind countertop is a flawless match, we'll consider the area's lighting sources, color scheme, floors and rugs, existing design elements, architectural style and natural surroundings. We’ll embrace those elements to create an all-encompassing and picturesque connection between your home and the outside world. The affect will be absolutely mesmerizing. Homeowners SAVE 25% off our already incredible prices. Simply fill out our Free Estimate form and submit it to us for your complimentary estimate (valued at $250). We’ll respond within 48 hours of your request. You may also use the Free Estimate form to send your design file, or give us a call at 818-266-2252. Hurry, this exclusive offer is available only while supplies last! Rejuvenating a bathroom? Ask about our vanity specials! Let us be of service to you! Choosing the right resource for your countertop solutions can make the difference between being on “pins and needles” and feeling peace of mind. When you know your designs are in the hands of experienced craftsmen who always meet your deadlines, you can go about overseeing the other aspects of your project with a sense of ease. Our highly trained and artistically inclined craftsmen are masters at creating countertops that meet the expectations of your discriminating clientele. We offer expert fabrication of sumptuous surfaces that range from sublimely tranquil to ornately neoclassic at surprisingly competitive prices. We understand that your reputation (and ours) is built on fulfilling your clients’ wishes, no matter how finicky; and we won’t skimp on the details. Your client’s countertop will be dotingly handcrafted with the same passion you felt when you envisioned its design. You’ll know you’ve made the perfect connection when clients refer you to their inner circle as the designer who can acquire exactly what they crave. Our professional estimate is free and without obligation. We invite you to upload your design file and send it to us using our Free Estimate form. You’ll hear from us within 48 hours of your request. You can also send us a message using the QUICK CONTACT box on the right side of this page, or call now to tell us how we can help. Our number is 818-266-2252. Let's get down to the business of building a thriving and long-standing relationship! If you’re like us, you take great pleasure in offering an impressive selection of amazing surfaces to your clients. National Granite has just what you need to outfit your showroom with natural and engineered surfaces that clients desire for interiors and exteriors of private residences, commercial properties and public places. Our lavish inventory ranges from raw to sleek, from natural to fabricated. We can readily provide your showroom with natural granite, marble, limestone, soapstone and travertine surfaces. We can even deliver on the newest trend in opulence, precious gemstones. 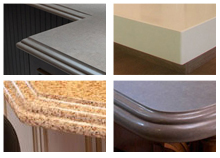 Our cache of engineered surfaces includes Silestone©, CaesarStone© and Vetrazzo©, all at incredibly competitive prices. If you need help with your displays or want more details about surfaces you plan to exhibit, give us a call at 818-266-2252. We’ll help you create an atmosphere that appeals to your discriminating clientele; and we’ll always be just a call away to answer your questions quickly. Our estimates are free and without obligation. All you need to do is upload your designs and send them to us using our Free Estimate form. We’ll get back to you within 48 hours of your request. You can also send us a message using the QUICK CONTACT box on the right side of this page, or call now to tell us how we can help. Our number is 818-266-2252. We look forward to doing business with you! 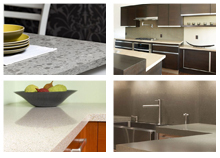 If you’re looking for a reliable source to handle all of your countertop needs, look no further than National Granite. We’re licensed, authorized and qualified to perform countertop fabrication and installation at incredibly competitive prices. We can also deliver surfaces right to your job site. We provide an extensive selection of surfaces in an array of colors that complement every scheme imaginable; and just as important, we understand your demands and expectations. We’ll see to it that the job is done right the first time and meets your deadline. Owner Carlos Chavarria will be on hand to personally oversee the fabrication and installation of your countertop surfaces. You’ll be free to manage the other aspects of your project, ensuring minimal loss of production time to your business. No matter what the scope of your project, replacing a single countertop or outfitting newly constructed commercial spaces, give us a call and let's discuss your project plan and time line. Our number is 818-266-2252. Our professional estimate is free and without obligation. We invite you to upload your design file and send it to us using our Free Estimate form. We’ll contact you within 48 hours of your request. You can also send us a message using the QUICK CONTACT box on the right side of this page, or call 818-266-2252 now to tell us how we can help.